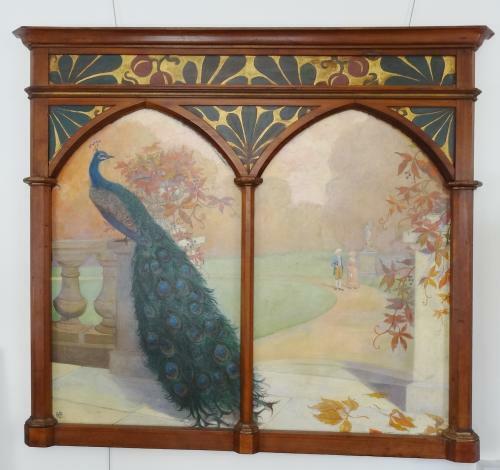 An extremely rare and visually stunning, late 19thC large oil on canvas, in it`s original painted tabernacle frame, by Kate Elizabeth Bunce (1856-1927), one of the leading female Birmingham School Pre-Raphaelite artists of the Arts & Crafts period, of a courting couple strolling in private grounds, and a large peacock in the foreground. Her painted monogramme to front and also signed to the stretcher on the back. Kate was the daughter of John Thackeray Bunce, newspaper proprieter and chairman of the City Art Gallery in Birmingham. She was a prize winning student at the Birmingham School of Art in the 1880’s and was later greatly influenced by the work of Dante Gabriel Rossetti and Edward Burne-Jones (a local Birmingham lad!). Associate of the Birmingham Society of Artists from 1888 and a founder-member in 1901 of the Birmingham based Society of Painters in Tempera. As a devout Christian, she also produced several works for churches, usually alongside her sister, who specialised in producing metalwork. After 1910, she concentrated on large scale commissions for church interiors, both in Britain and Canada; not dissimilar from Phoebe Anna Traquair’s work in Scotland. Kate Bunce paintings very rarely appear on the open market and a few of her paintings are held at the Birmingham Museum & Art Gallery in England. Her work was also illustrated in The Studio magazines of the time. Ref: Pre-Raphaelite Women Artists by Jan Marsh & Pamela Gerrish Nunn, pub. by Thames & Hudson.